If you want to develop mental toughness, you must master five areas of thinking. Just like the physical skills, your mental skills need repetition to eventually become automatic and instinctive. In the heat of battle, instant mental recall is critical to stabilize your game. Here are the five areas to conquer. Emotions in a match are fine, but when you allow your emotions to influence your thinking your perception of reality becomes distorted. "The next shot is more important than the last mistake" becomes "The last mistake is more important than the next shot." This is totally the opposite of the correct viewpoint. 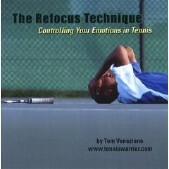 The correct tennis principles in your mind must dominate the emotional reactions that are counterproductive. You know you have gone astray when everything becomes a problem. You can't handle the failures, the adversities and, above all, the pressure situation. When this occurs it is essential to use the Refocus Technique, "the next shot is more important than the last mistake," to keep your emotions in check. The pitfall of thinking that winners wins matches is universal. The confusion comes from watching pros hitting that dynamic winner that brings out the applause. "Aha!" you figure, "That is the way to win!" Of course the pro's consistent play throughout the match is ignored. Only the spectacular and fantastic is remembered. This results in attaching hitting a winner to nothing! What I mean by that is, the best players attach hitting a winner to consistent controlled play first. Once they establish consistent play, the winners become a natural result. This simple logical progression eludes most players. Do not be one of them. We have been over this mental principle many times. When you play you must learn to play with no tentativeness or cautiousness. Whether you are hitting the ball hard, soft or with a medium touch, the absence of cautiousness is the mark of a champion. But the freedom to go for your shot is not possible if you fear failure. Self-doubt and playing not to win� leads to cautious play, while no fear of failure leads to the mental freedom to just play! Paralysis by analysis! Players over-think everything from learning the game to playing under pressure. The concept of relentless practice while allowing the game to unfold naturally is foreign to them. Instead every little minute detail is over-thought and over-analyzed in hopes of quick results with less practice. Avoid paralysis by analysis and you will develop spontaneity through preparation. Over time, monitoring yourself becomes a natural way of thinking. Champions are constantly keeping mental tabs on themselves to keep their emotions in check, maintain a correct long-term strategy, play with mental freedom and not get bogged down in inconsequential details. These are the other four mental concepts we have just covered. Monitoring himself helps a player change his course when he recognizes he has gone astray. You must learn to do the same. Combine all five of these mental concepts and you have a powerhouse of thinking to develop mental toughness. But remember, you learn everything in increments. You'll need time and lots and lots of practice to allow the mental and physical process to teach you. 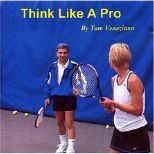 The process is always the cornerstone and the great teacher in the Tennis Warrior System.